Part of the fun of any road trip is stopping for a bite to eat at unique restaurants and cafes along the way. That’s especially true of a Route 66 road trip, where the journey just isn’t complete without a meal or two in a kitschy roadside diner. And in that respect, Kingman, Arizona has just what the doctor ordered. Sandwiched between two intact sections of the Mother Road, Kingman is the ideal spot to park the car and enjoy a indulgent repast at one of these retro choices. And the good news is, they’re also a good choice for wheelchair-users and slow walkers. Located across the street from the Powerhouse Building on the west side of town, Mr. D’z is a required stop on any Route 66 adventure. Accessible parking is located on the side of the building, with level access to the restaurant. There are several wheelchair-accessible tables inside, as well as some picnic tables on the front patio. The single-use restrooms are large enough for wheelchairs, however the doorways are on the narrow side and the toilets lack grab bars. This vintage diner is open for breakfast, lunch and dinner, and the menu features a selection of hearty breakfast dishes, a large burger menu, and a good variety of soups, salads and daily specials. And of course sundaes, malts, milk shakes and other ice cream confections are also available. 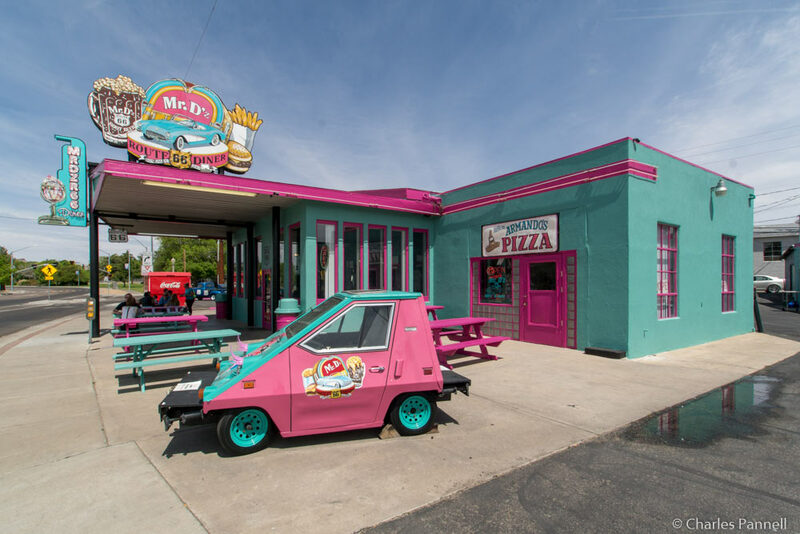 Even if you don’t go in, stop by to see the incredibly cute Little Miss DD, a colorful little vehicle complete with eyelashes that’s parked in front of the diner. If you find yourself craving some Asian fare, then be sure and stop in at this hidden gem, which is located next door to the Powerhouse Building. 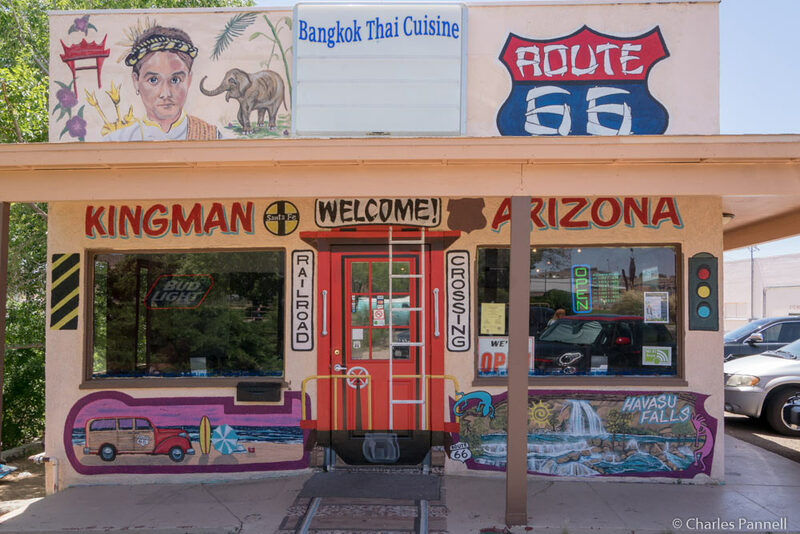 It’s hard to miss as it’s creatively adorned with colorful Route 66 murals. There’s no accessible parking, but the parking lot is paved and level, and there’s also accessible parking next door. The restaurant features level access to the front door, with room for a wheelchair to maneuver around the tables. The menu includes a good selection of noodle, rice, and curry dishes, and the quality is excellent. Top it off with good service and reasonable prices and you have a real winner. Don’t let the lack of an accessible restroom deter you from enjoying this fine food, as accessible facilities are also available in the adjacent Powerhouse Building. This family restaurant is also located on the west side of town, near Motel 6. There’s curb-cut access up to a cement walk over to the front door, and an oversized parking space on the side of the building. There are also several accessible parking places in the adjacent Motel 6 lot. Inside there’s table seating with plenty of room for wheelchairs and scooters, and a barrier-free pathway to the accessible restrooms. Open all day, this popular eatery serves up breakfast staples, and offers soups, salads, sandwiches, as well as a nice selection of entrees and daily specials the rest of the day. There’s also a soup and salad bar available, and several menu selections feature smaller portions for lighter eaters. On the other hand, some of the sandwiches and entrees are certainly large enough to share. Finally, don’t miss Rutherford’s 66 Family Diner, which is located on the east side of town. This classic Route 66 diner is easy to spot — just look for the collection of gas pumps and other Mother Road memorabilia in front. Accessible parking is located near the front door, with level access over to the entrance. There’s booth, table and counter seating inside, with plenty of room to maneuver a wheelchair. The single-use restrooms each have a toilet with grab bars in a 36-inch wide alcove; and although the doorways are wide, folks with larger wheelchairs may have problems with the tight approach. The diner is open for breakfast lunch and dinner, and the menu includes breakfast favorites, soups, salads, sandwiches and hearty entrees. And even though some portions are quite large, there are also choices for folks with smaller appetites. 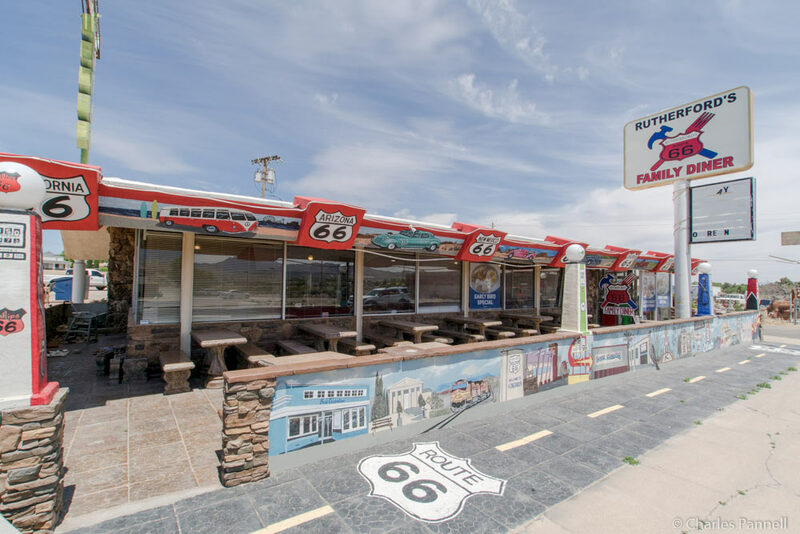 It’s a great lunch stop on any Route 66 ride, and with all the memorabilia, it’s also an attraction in its own right.